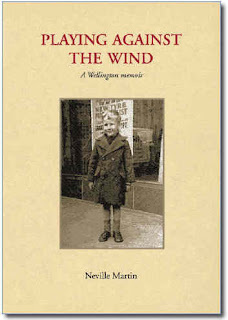 Beattie's Book Blog - unofficial homepage of the New Zealand book community: Playing Against the Wind, a Wellington Memoir (Ngaio Press) by Neville Martin. 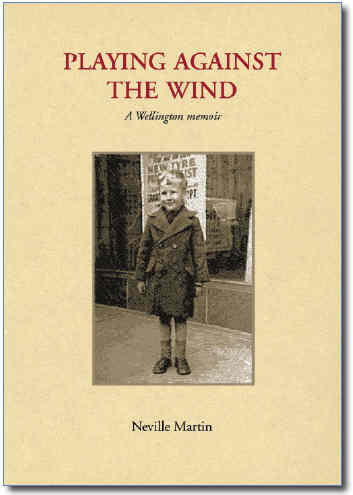 Playing Against the Wind, a Wellington Memoir (Ngaio Press) by Neville Martin. All journalists are sure they have a book inside them but few ever get it out, for which I’m sure we should mostly be thankful. But let’s be grateful that Neville Martin managed it because his little memoir of Wellington in the late 1940s and early 1950s is a gem. It is worth reading every well-placed word. And I know how true it is because I was there at precisely that time. I didn’t know Martin until years later. By then he was the voice of the New Zealand Dairy Board at a time when public relations was a lot less shrill than now, its work more involved in dispensing information. He was very good at that. This book has only seventy-seven pages but it has the two inestimable qualities that most enrich memories of childhood – charm and authenticity. He says in an introduction called I Used to Live in Wellington (which is his way of saying he is still there but the city has changed): ‘Looking back, life for the young then was less standardised, codified and certainly less cosseted’, and then goes on to demonstrate how true that is. What he manages is truly rare. He writes in the relaxed understatement of the time. He runs his late-in-life eye over his parents and the members of his extended family without flinching at their frailties, but without a trace of bitterness and no sense of being a judge of their behaviour. It is extraordinary how he manages in such a small space to evoke the atmosphere and attitudes of the Wellington of his childhood.